I'm regularly using the cyclically adjusted PE ratio (CAPE or PE10) in an attempt to value the S&P500 and the ASX200. As hard as I've looked though I've never been able to find this valuation metric for the FTSE100 so I've built my own dataset at the link above from where I've also taken the two charts. 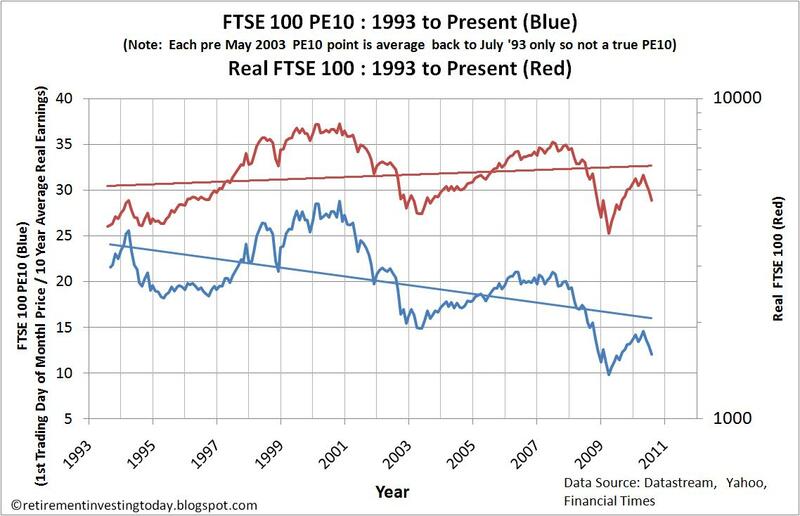 Eyeballing the charts above suggests the PE10 seems to be heading back towards the lows of 2009 and looking at the ratio since 1993 (which I admit is a short period of time) using this measure of value suggests that maybe the FTSE100 is getting towards good value. 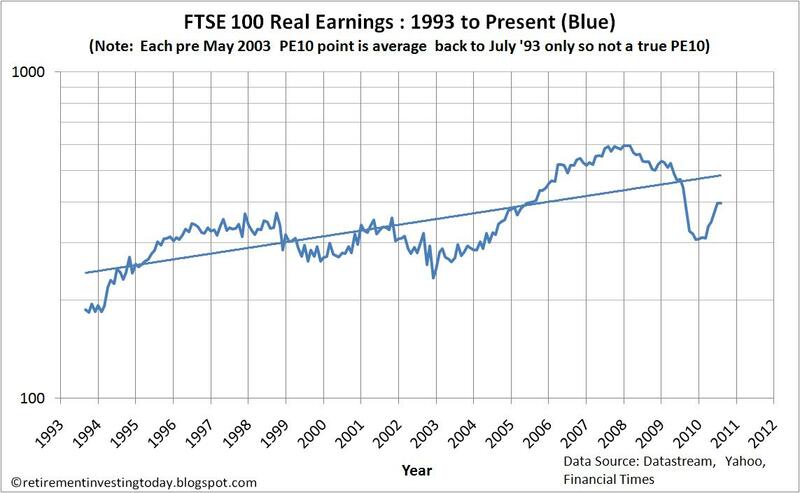 In contradiction though it's interesting to look at the real inflation adjusted earnings. They sat at around 300 for many years before taking off around 2004. Was this all just froth from people getting into debt. Real earnings then fell and made it back to 300 however we know a 'shot of adrenalin' was delivered in the form of QE and big deficit spending. What I'm wondering is if over the next few years real earnings will return to around 300 which would knock 30% or so from earnings. This would push the CAPE up without any increase in prices removing much of this perceived value. At a p/e of 15 the stocks are earning a yield of 6.7%. But remember that's after tax and all expenses. A typical BTLer is happy with a gross yield of 5%. To get a net after tax yield of 6.7% you'd need a gross yield of over 10%. And remember it's a hell of a lot easier to liquidate your stock portfolio if you need to. Shows how much houses are overvalued IMO. So the FTSE 100 is trading at a PE10 of about 12.5. 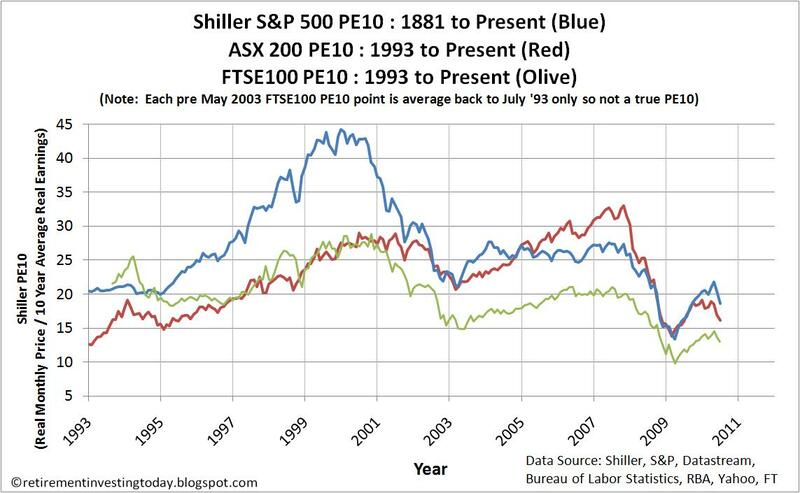 Interesting as the Shiller data for the S&P 500 is at a PE10 of nearly 20. Both indices are full of multinational companies with what I would expect are not too dissimilar earnings growth so why such a premium for the US market? The valuations were just about the same in 1995 but the S&P 500 has traded at a premium ever since. ... and both the PE10 and the PE are a lot lower than 15 today. My data for the PE0 was based on the 1st of July prices and earnings and was sitting at 12.11. The PE as you mentioned is sitting at 12.97. I agree with you on house prices being overvalued. I've captured all of my thoughts here http://retirementinvestingtoday.blogspot.com/2010/07/houses-are-still-overvalued-uk-property.html but in short The Economist suggests 33.8% overvaluation and using 2 different metrics (one bearish and one bullish IMO) I think 22% to 50%. Wide spread I know... If pushed I'd lean towards 22% however that's just to 'fair' value. In any fall/crash you should get an undershoot. I'm actually wondering if it might have anything to do with how earnings are taxed in the respective countries. I haven't made it much further than that though. To explore further you'd have to look at how taxation of companies in the different countries has changed over the last 17 years. Wow! Look at what the commodity bull market did to the ASX up to 2008. Would probably rank as one of the great bubbles of all time if it weren't completely overshadowed by the tech mania in 2000. Exactly and that's what I'm hoping to take advantage of with my long term investing strategy. In the broad sense I am all about strategic asset allocation in the usual boring suspects bonds, commodities, cash, equities etc etc. However I also mix it up a little by adding a tactical element which varies my allowable equity asset allocations by looking at the PE10 valuations. In crude terms I'm looking to be light equities when the PE10 is high and vice versa. So far it seems to be working as I've beaten my benchmark since 2008. I admit though that some of the win has come from the devaluation of the pound however I was also light equities based on the PE10 before the recent adjustment in prices to give just one example. Of course this strategy could all go horribly wrong in the future. I guess that's the risk of DIY. Only time will tell if I am smart or incredibly foolish. I've been doing roughly the same thing since the 90s and it has worked fine. Of course I missed out on big gains in 98 and 99 but then again I was nicely positioned in REITs and small value stocks for the debacle that followed. I'm sure your strategy will far outperform all the traders around here who are constantly making market timing predictions. The key is keeping your transaction costs down. As far as equity investments go are you aware of fundamentally weighted indices? These have been shown to add a couple of percent annually to your returns which if it continues will be a huge boon in a low return world. Good to know there are some other like minded people out there. I tried a little trading and was absolutely hopeless at it. I'd do better with the lottery I think. LOL. I have heard of fundamentally weighted indices but I stick with the common S&P500, FTSE100, ASX200 etc as they enable me to calculate the PE10 ratios from commonly available data. I think I'd struggle to get price and earnings data for fundamentally weighted indices. Doesn't look like this website is being updated anymore but it is filled with good information about portfolio construction. Also a good place to get acquainted with the Fama & French paper in the early 90s that shows that stock returns are based on three things: amount of exposure to the market as a whole, the valuation of the the stocks in the portfolio usually by price to book, and the average market cap of the stocks in the portfolio. By studying practically all fund performance in the US up to that point they proved that these three factors explained almost all returns and that individual stock selection accounted for virtually nothing. Thanks for that MP. I was aware of that site. One of the editors of that site, Bernstein, wrote the book The Intelligent Asset Allocator. IMO it is a great book from which I learnt plenty. Have you read it? For a more UK focused read I'd also recommend Smarter Investing: Simpler Decisions For Better Results by Hale. I agree with everything you say TDL. Ideally I would have gone back a lot further which is what I mentioned on my blog post. Unfortunately though it has taken many hours just to piece what I have together. The information is just not freely available out there. I also cannot find anything pre 1993. I'm thinking what I have is better than nothing though and will keep a close eye on how it transpires going forward. As I also mention on my blog my FTSE (All Share typically) tactical asset allocations actually using the S&P500 PE10 as as a proxy. I have data going back to 1881. I then rely on a high correlation between the two markets. Not perfect either I know. I'm now going to watch the S&P500 PE10 carefully and continue to use for tactical allocation while keeping one eye on the FTSE100 PE10 for now.